Washington DC's Soccer Team make their debut with this album, which despite being in part recorded via fourtrack is an impressively rich and varied affair, with particularly refined drum recordings setting this duo apart from so many of their bedroom project peers. Ryan Nelson and Melissa Quinley take turns fronting these songs, which range from Autolux-meets-The Shins style jaunts like "Cavity Called Home' to the Breeders-esque clatter of 'Lobster Season', even occasionally dipping into the throbbing bass tremors and mushed up breaks of 'Solid Ring Fighters'. The songwriting can reach some dizzily high standards, bringing to mind Elliott Smith on the brilliant lo-fi disclosure 'Here's Why Dancers Smoke', a track that by rights shouldn't appear on the same record as intriguing dissonant emissions like 'Platonic, Unrequited, Tragic'. "Soccer Team is the work of Ryan Nelson and Melissa Quinley. Ryan, an employee of Dischord Records, also is in the Routineers and formerly played in both Most Secret Method and Beauty Pill. Melissa is a former employee of Dischord. 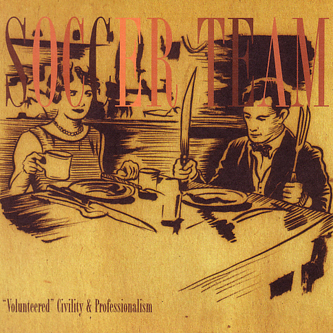 The songs on Soccer Team's record were primarily recorded to 8-track 1/4" tape, and / or 4-track cassette, by Ryan, in Southeast Washington, DC. The songs are a result of desultory late nights, Ryan's gifted, unfailing profusion of ideas and sounds, and Melissa's occasionally obdurate 2¢. Although principally a recording project, Soccer Team has been playing select shows as a trio with Justin Moyer (Antelope, ex- Supersystem) on drums. " Recommended.